The mitigation of anthropogenic climate change in the European Union is being addressed through a number of measures. 2 emissions of any sector over the last 25 years, growing by 124 Mt. Aviation also grew by 93 Mt over the same period, a massive 82% increase. Trifluoromethane (HFC-23) is generated and emitted as a byproduct during the production of chlorodifluoromethane (HCFC-22). HCFC-22 is used both in emissive applications (primarily air conditioning and refrigeration) and as a feedstock for production of synthetic polymers. Because HCFC-22 depletes stratospheric ozone, its production for non-feedstock uses is scheduled to be phased out under the Montreal Protocol. However, feedstock production is permitted to continue indefinitely. In the developed world, HFC-23 emissions decreased between 1990 and 2000 due to process optimization and thermal destruction, although there were increased emissions in the intervening years. The United States (U.S.) and the European Union drove these trends in the developed world.Although emissions increased in the EU between 1990 and 1995 due to increased production of HCFC-22, a combination of process optimization and thermal oxidation led to a sharp decline in EU emissions after 1995, resulting in a net decrease in emissions of 67 percent for this region between 1990 and 2000. The decline in emissions from 1990 to 1995 in the OECD is largely due to non-climate regulatory programs and the collection and flaring or use of landfill methane. In many OECD countries, landfill methane emissions are not expected to grow, despite continued or even increased waste generation, because of non-climate change related regulations that result in mitigation of air emissions, collection of gas, or closure of facilities. A major driver in the OECD is the European Union Landfill Directive, which limits the amount of organic matter that can enter solid waste facilities. Although organic matter is expected to decrease rapidly in the EU, emissions occur as a result of total waste in place. Emissions will have a gradual decline over time. Climate change affects both people and the environment in the world as well as in Europe. Human-induced climate change has the potential to alter the prevalence and severity of extreme weather like storms, floods, droughts, heat waves and cold waves. These extreme weather changes may increase the severity of diseases in animals as well as humans. The heat waves will increase the forest fires. Experts have warned that the climate change may increase the number of global climate refugees from 150 million in 2008 to 800 million in future. International agreement of refugees does not recognize the climate change refugees. The summer of 2003 was probably the hottest in Europe since at latest ad 1500, and unusually large numbers of heat-related deaths were reported in France, Germany and Italy. According to Nature (journal) it is very likely that the heat wave was human induced by greenhouse gases. 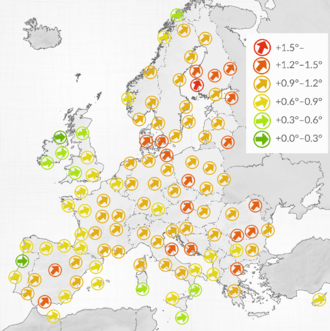 According to European Environment Agency (2012) the average temperature over land in Europe in the last decade was 1.3 °C warmer than the pre-industrial level, which makes it the warmest decade on record. Exceptional melting in the Greenland ice sheet was recorded in the summer of 2012. Arctic sea ice extent and volume have been decreasing much faster than projected. A study of future changes in flood, heat-waves, and drought impacts for 571 European cities, using climate model runs from the Coupled Model Inter-comparison Project Phase 5 (CMIP5) found that heat-wave days increase across all cities, but especially in southern Europe, whilst the greatest heatwave temperature increases are expected in central European cities. For the low impact scenario drought conditions intensify in southern European cities while river flooding worsens in northern European cities. However, the high impact scenario projects that most European cities will see increases in both drought and river flood risks. Over 100 cities are particularly vulnerable to two or more climate impacts. ^ Annual European Union greenhouse gas inventory 1990–2014 and inventory report 2016: submission to the UNFCCC Secretariat — EEA Report No 15/2016. Copenhagen, Denmark: European Energy Agency (EEA). 17 June 2016. Retrieved 2016-06-21. ^ "EU greenhouse gas emissions at lowest level since 1990". 21 June 2016. Retrieved 2016-06-21. ^ Kayser-Bril, Nicolas (24 September 2018). "Europe is getting warmer, and it's not looking like it's going to cool down anytime soon". EDJNet. Retrieved 25 September 2018. ^ Guerreiro, Selma B.; Dawson, Richard J.; Kilsby, Chris; Lewis, Elizabeth; Ford, Alistair (2018). "Future heat-waves, droughts and floods in 571 European cities". Environmental Research Letters. 13 (3): 034009. doi:10.1088/1748-9326/aaaad3. ISSN 1748-9326. ^ Foundation, Planet Ark Environmental. "Planet Ark Stories and Ideas". Planet Ark. Retrieved 14 April 2018. Climate change in the EU. This page was last edited on 5 April 2019, at 16:29 (UTC).